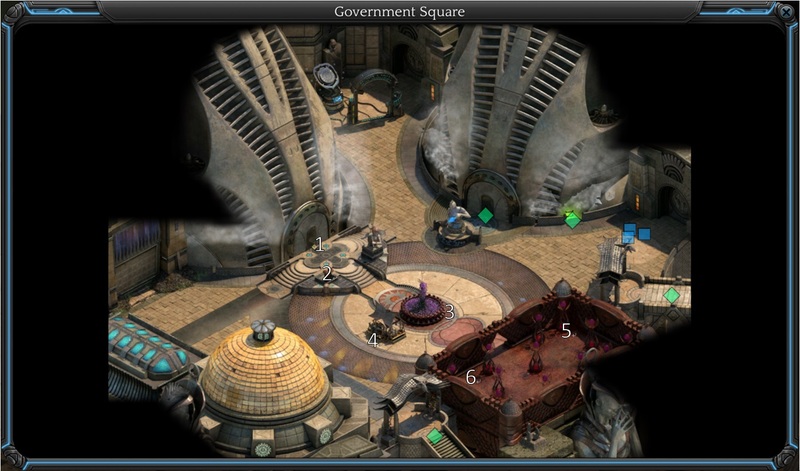 Government Square in Torment: Tides of Numenera is the political center of Sagus Cliffs. The Council Tower hosts Council meetings. 2XP, catch one of the creatures in the fountain and listen to it. 2XP, examine the archway north of the Order of Truth (Area). 2XP, repeatedly looking through the orbiting holes in space at the generator near the archway. 2XP, trading a secret with Iyene Who Knows. Cyclonic Cube, from looking through the holes in space orbiting around the archway generator. Jalley, from catching one of the creatures in the fountain.